All the PARTS, All the Time! Thank you for visiting the Tropical Marine Air Conditioning, Inc. web site. Please use the contact info below. 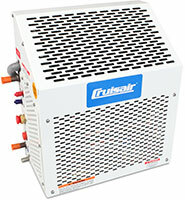 Cruisair Refrigeration Systems may be designed to perform as refrigerators or freezer boxes in custom applications. Below are the components necessary for all your refrigeration needs. The KRA series cabinet condensing unit is designed for use in direct expansion refrigeration and freezer systems, such as cockpit freezers/refrigerators or catch box chillers. The condensing unit works in conjunction with evaporator plates installed in an insulated box, or a box wrapped with evaporator tubing. Box temperatures between -5 degrees and 40 degrees F (-20 degrees and 5 degrees C) can be achieved with the proper application. The condensing unit is housed in an attractive white aluminum enclosure which can be mounted on a vertical bulkhead or a horizontal shelf. Units are available with 3 different size compressors: 1/4HP - 115V 60 Hz or 230 60Hz only units. The KRA condensing units have both air and water condensers. The air-cooled condenser is supplemented by a durable cupra-nickel water condenser. The unit is typically installed in the engine room or other mechanical space, with copper or flexible refrigerant tubing connecting the evaporator. Quick connect fittings on the condensing unit are self-sealing and a built in sigh glass/moisture indicator can help identify possible problems. Tropical Marine Air Conditioning, Inc. services and sells marine equipment and Cruisair Parts- Marine Air, AquaAir, Technicold, and Cruisair air conditioning, refrigeration by U-Line, Spot Zero and Sea Xchange, ECOmar Sewage Treatment Systems, and Eskimo Ice ice machines. CONTACT US for your marine parts and equipment needs. Thank you for your interest in Tropical Marine Air Conditioning! Follow us on Facebook or Pinterest. Copyright Tropical Marine Air Conditioning, Inc. All Rights Reserved.